US Secretary of State Mike Pompeo on Wednesday arrived in Ankara for talks with the Turkish leadership over the disappearance of Saudi journalist Jamal Khashoggi at the kingdom's consulate in Istanbul. 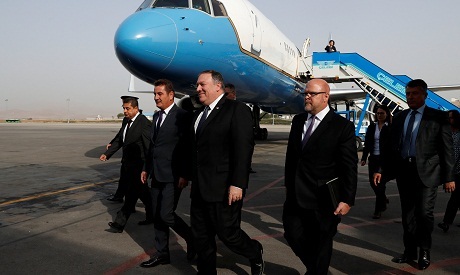 Pompeo, arriving fresh from talks in Saudi Arabia, touched down at Ankara's Esenboga Airport, and immediately went into a meeting with President Recep Tayyip Erdogan at the VIP lounge before the Turkish leader flies to Moldova, an AFP correspondent said. Pompeo, who will also meet Turkish Foreign Minister Mevlut Cavusoglu, visits Ankara after a trip to Riyadh where he held talks with King Salman, Crown Prince Mohammed bin Salman and other senior leaders on the case of Khashoggi. The Saudi journalist has vanished since he stepped inside the Saudi consulate in Istanbul on October 2. Speaking to reporters on a plane taking him from Riyadh, Pompeo said Saudi Arabia has promised to carry out a thorough and transparent investigation into the case. The Turkish delegation, including police and prosecutors, searched the Saudi consulate on Monday after Riyadh gave the green-light.